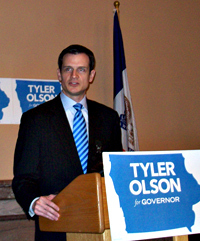 State Representative Tyler Olson launched his campaign for governor today with repeated references to the need for “new” and “fresh” leadership at the top of state government. Olson, an attorney from Cedar Rapids who is 37 years old, isn’t shy about focusing on Republican Governor Terry Branstad’s long tenure in office. “Living at the end of the last 30 years with the same leadership we had in the early 1980s is just not going to get the job done,” Olson said during an event at the statehouse. Branstad was first elected governor in 1982. He served 16 consecutive years, took a 12 year hiatus and then in 2010 ran for and won a fifth term. He’s already hired staff for a 2014 reelection campaign. Olson is critical of Branstad’s record, especially what Olson characterizes as an economic development strategy wrongly focused on “big fish” corporations. Olson argues that with the 66-year-old Branstad at the helm, the state is struggling to keep up in a rapidly changing world. 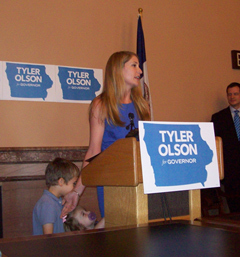 Olson’s wife was given the job of introducing her husband to a crowd at the statehouse, but the couple’s five-year-old son and two-year-old daughter kept competing for their mother’s attention. Olson joked about the kids’ antics, too. Olson has been a member of the Iowa House since January of 2007. Long-time Democratic legislators Jack Hatch and Mike Gronstal are both pondering the race for governor, too. Hatch has publicly set a fundraising goal for himself and begun issuing campaign statements. Gronstal has said he’ll make his decision about the race by the end of the summer. During a conference call earlier today with Iowa reporters, Branstad declined to comment on Olson’s candidacy, saying it’s up to Democrats to decide who their gubernatorial nominee will be.